Re-establishing its leading stature in the water purifiers segment, Kent RO systems limited has been adjudged Asia’s Most Promising Brand while its chairman Mr. Mahesh Gupta has been conferred with the Most Promising Leader title, according to a survey conducted by KPMG and commissioned by World Consulting and Research Corporation (WCRC). Siddharth Behal, Director Risk Consulting KPMG conferring The Asia’s Most Promising Brand Award to Mahesh Gupta, Chairman, KENT RO Systems Ltd.
Asia’s Most Promising is a first ever project on brands and entrepreneurs involving the most promising nations of Asia for business. With the theme, Rise of Asia, 200 brands were featured in 50 industry categories to form the “most promising brands” of Asia to bring to the fore the companies that have shown tremendous growth in the past five years. The focus was on brands with revenues less than $10 billion that are successfully taking on and beating their competitors through their steady growth and presence. For the first time ever, it also brought out leaders who have led from the front to make their companies the most promising brands. KENT was chosen the best in its category for the its continued efforts to provide people the freedom from water-related problems and peace of mind for good health through their wide range of healthcare products that deliver impeccable standards of quality and service. 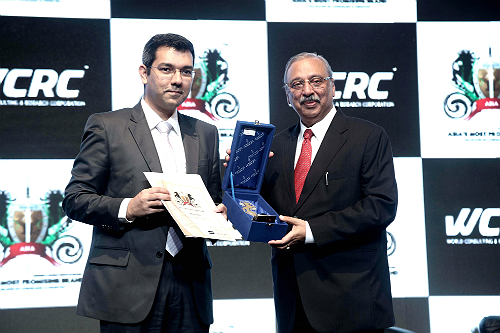 Abhimanyu Ghosh – Editor-in-Chief for Asia’s Most Promising (left) and Saeed Ali BinRedha – CEO of Global Village (right) conferring the award of ‘Asia’s Most Promising Brand’ and ‘Most Promising Leader’ to KENT RO Chairman Mahesh Gupta. While accepting the award, Gupta said: “For us at KENT, this award reflects our commitment to provide the purest water to people. It also showcases the immense trust people repose in us. So bring home a KENT water purifier today and become a part of Asia’s largest family”. Pioneers in bringing the revolutionary RO technology to India, Kent through its technologically advanced products and commitment to quality has steadily risen to become the largest selling RO brand in the Rs 3,800 crore water purifier market in India. Today its products range from Water Purifiers, Air Purifiers, Vegetable and Fruit Purifiers to Water Softeners and water pressure boosting systems. Kent RO systems, in the past as well, has won several awards and accolades such as the Best Domestic Purifiers Award by UNESCO 2013, Indian Power Brands 2013, India’s Most Trusted Water Purifier Brand 2013, Distinguished IIT alumnus awards 2011, Water Digest International in 2006-2007 and 2007-2008, The Golden Peacock Award for the best Eco-Innovation in 2007 and Gold Seal Award.